A step-by-step guide to finding and nurturing your child's interests, passions and brilliance. 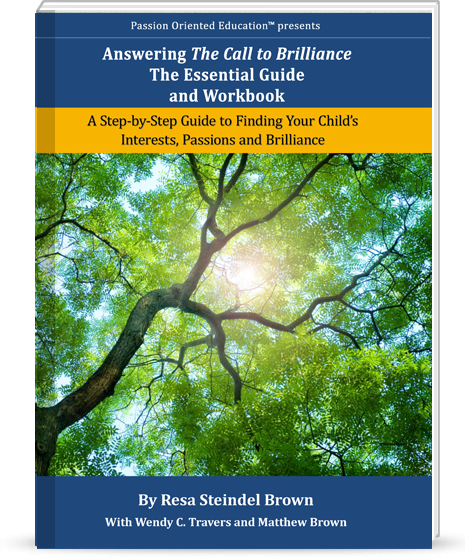 'Answering The Call to Brilliance, The Essential Guide and Workbook,' also referred to as The Workbook, provides you with a hands-on, step-by-step process to help you identify your child’s interests, fuel your child's passions and ignite those passions into personal brilliance. We created this guide from a process we have successfully used with our own children and countless families for over three decades. We are now making it available to you. The Workbook is divided into three units, Interests, Passions and Brilliance. Each unit is designed to be read sequentially, even if you have already discovered some of your child's gifts. Each step is designed to help you think about things differently, understand your child better and nurture his or her creative abilities in ways you may have never considered. There is enough material in this book to work with your child throughout your child's growing years. So take your time and follow your child's natural pace. The Workbook is applicable to all ages, at any stage of development. As we have found using this material with our own children, every child's timetable is different, even inside the same family. Unit I Interest will help you discover, nurture and expand your child’s interests, the first step toward igniting passion. The journey begins by identifying your child’s unique learning styles and forms of intelligence. We will show you how to refine this information in a way you probably have not considered before. You will use this new information to fine-tune your child's current activities and expose your child to new activities better suited to your child's innate abilities and interests. You will learn to identify which activities are passive, false, misdirected, or active and internally-driven and how to take the next step. Your goal is to prioritize and broaden your child’s full range of active interests, providing increased opportunities within which passion can grow. Unit II Passion will help you fuel and ignite your child’s active interests into passions. We will show you how to identify specific themes within your child's range of active interests and prioritize which activities within those themes are most likely to help your child's passions flourish. Along the way, you will learn how to better observe your child’s behaviors and natural pacing to facilitate passionate absorption on the path to personal brilliance. We will also help you manage the time, energy and resources necessary to prioritize passion and accomplish your objectives. Your goal is to deepen your child's connection to passion and creativity. Unit III Brilliance will help you bring your child's brilliance forward and share it with the community and world around you. We will help you identify ways to bring your child’s creative skills into tangible form at a professional level, exploring what it takes to create a product, business or service organization. You will learn how to monitor your child's progress and read the signs that tell if your child is internally and passionately motivated, ready and mature enough to step out into the community. We will help you brainstorm ways to introduce your child to hobby and networking organizations, mentors and internships. All of these activities will culminate in a professional resume and portfolio. At the end of this phase of your journey, we will explore the meaning of and purpose for finding passion and brilliance in relation to life-long success. 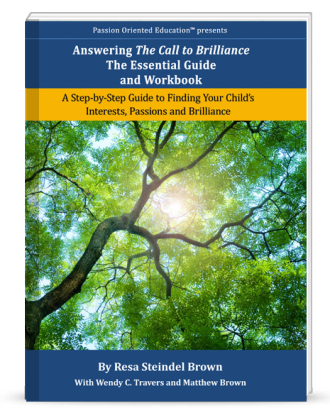 Answering 'The Call to Brilliance,' The Essential Guide and Workbook, is a journey of joy and exuberance. It is designed to help you find your child’s passions and nurture them into personal brilliance. Using The Workbook in a step-by-step sequential manner, produces amazing results. It creates a culture of trust and exploration in which your family can blossom. Your child will be happier, your relationship will deepen and grow, and creativity will abound.